This one was given to me by one of my favorite people on the planet, Jessie. It's actually from the December 2006 issue of Bon Appetit, but since Jessie gave it to me, she gets the credit. Thanx Floss! 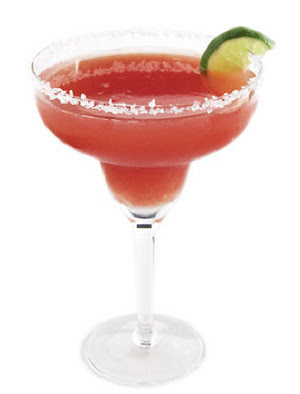 To make the Margarita base for 12 drinks blend all ingredients in a blender until smooth. Pour out half of Margarita base into a glass measuring bowl. Set aside. To the other half add 3 1/2 cups ice cubes and blend until it's slushy; pour into salt-rimmed Margarita glasses. Garnish with cranberries. Pour second half of Margarita mixture back into blender and repeat process, adding another 3 1/2 cups ice cubes. Be sure to get Grand Marnier instead of using Triple Sec or some other lower grade of orange liqueur. It really does make a difference. It's the same with the Tequila. You don't have to use top shelf, but try not to get the bottom of the barrel.